1 Pre-heat oven to 375°F. Line two baking sheets with parchment paper..
2 In a large bowl, using an electric mixer, cream together butter and sugars until fluffy, about 2 minutes. Add molasses and vanilla extract, mixing until incorporated. Add egg and mix until light and smooth, about 1 minute on medium speed. 3 Sift together flour, salt, and baking powder. Fold dry ingredients into wet mixture. Use electric mixer to blend just until flour is incorporated. Divide dough in half and flatten into two disks. Wrap disks in plastic wrap and refrigerate at least an hour and up to 2 days. 4 Remove any wrappers on candies and separate them by color into plastic bags. Using a mallet to crush candies. 5 Place one disk between two large sheets of waxed paper and roll to 1/4-inch thickness. Use cookie cutters to cut dough into desired shapes. Transfer cookies to prepared baking sheets, about 1 inch apart. Using a smaller cookie cutter or a knife, cut shapes into centers of cookies, reserving these center bits to add into extra dough. 6 Use a spoon to sprinkle the crushed candy into the hollowed-out centers of the cookies, filling to the edges. Try to keep the candy within the centers. Any candy specks that fall on the cookie will color the cookie. 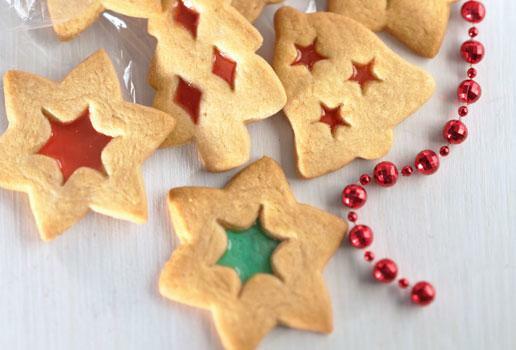 7 If cookies will be hung as ornaments or decorations, poke a small hole in the top of each cookie before baking. 8 Bake 9 to 10 minutes. The candy should be melted and bubbling and the cookies just barely beginning to brown. Remove baking sheets from oven and place on wire racks to cool. Allow cookies to cool on pans at least 10 minutes; otherwise, the candy centers may separate from the dough. When cookies are completely cooled, remove and store in an airtight container. String with ribbon if you want to hang as an ornament. More info about this recipe.